Russian scientists have discovered the cure for all diseases. Such claims from the doctors in local clinics might seem absurd at first. But do not rush to conclusions. Researchers of two well-known Russian institutes have almost simultaneously without contacting each other come up with ‘live’ and ‘dead’ water. Both have equal chances to become the cure for all sicknesses! MK reporters went in for an interview and a sip of miracle liquid. The de-ionized, or ‘dead’, water was first mentioned as a study project back in the 1990’s. At that time the theory of two professors from Science Center of Applied Research (SCAR) – Valentine Samoylov and Oleg Zaymidorogawere looked at as fairytales. But now no one would dare laughing at the ones who take the foundation for their ‘live’ and ‘dead’ waters from the kitchen! ‘It began with my experiments in Italy in the field of physics. I had to design such water for the research that would contain no radioactive traces and no microorganisms. So we began purifying the regular tap water. We passed it through the filter and then removed the 95% of metal ions. Then next step was to remove the rest of radioactive ions and from the heavy isotopes of oxygen and hydrogen. Finally we got rid of the dead bodies of microorganisms and ended up with super pure de-ionized water that is thousands of times more sterile than any artificial solution. The scientists immediately offered their product to the Surgical Institute of Vishnevsky and the St. Petersburg Institute RAN. Recently the biochemical tests have been completed. Believe it or not, the tests showed that the miracle water can cure infections and tumors. In the case of blood poisoning de-ionized water restores the torn DNA threads and helps the wound to heal faster, the scientist explains, As for the cancer , this water has the power to affect the bio-energetic molecule ATF, which is responsible for cell division. So when a cancer patient receives the de-ionized water injection the ATF molecule no longer misses the moment of random cell multiplication. The tumor growth will be stopped. As for using the magical liquids healing power in terms of taking on the qualities of the medicine it interacts with, this part awaits further research. The time approaches when we will cure our diseases with mere water. Scientists from the Center of Applied Research have concluded after launching large-scale experiments that the water in blue bottles can be harmful because after a time it acquires zirconium, a metal that gives the bottle a light bluish color. A report on the newly discovered sources of water having healing properties as a result of being energized by Maitreya. In 1858, 14-year-old Bernadette Soubirous of Lourdes, France claimed that a manifestation of Mary, the mother of Jesus, appeared to her many times warning her of future perils for humankind and instructing her in the ways of spiritual truth. In the grotto where she said this occurred, there flowed a spring which came to be known the world over for its healing properties. Today it is accepted as authentic by Christians everywhere. Millions of pilgrims a year drink from its waters, receiving partial and total cures of physical and emotional ills. In Christianity, faith healings like these are part of a long accepted tradition, and such “gifts of the spirit” date back to apostolic times. In our own decade similar stories of totally new healing waters are being reported from several corners of the globe. Wells, long run dry, are gushing forth with water of sparkling purity, underground springs are bubbling to the surface. People who use the waters speak of chronic illnesses suddenly eased. Believers and non-believers alike relate similar beneficial results. Here we tell some of the stories we are beginning to hear, and offer at the end a possible explanation, one person’s idea of a link connecting all of the phenomena. The ‘Lourdes’ of Mexico: One of the earliest reports came from Tlacote, Mexico, a small village 150 miles north of Mexico City. There in 1991, on a chicken ranch belonging to Jesus Chahin Simon, his dog, Lucas, was cured of wounds after drinking from a well. Chahin tested the water, with great success, on his ranch workers and farm animals, then decided to make it available to everyone, free of charge. With government help he set up a modern storage, pumping and purifying system. Though the number of visitors has now declined, four or five years ago as many as 10,000 people a day often lined up at his gate, some in wheel chairs or walkers, patiently waiting their turn. Chahin has kept scrupulous medical records, and cures of diabetes, high blood pressure, glaucoma, arthritis and many other ailments are well-documented. In addition, the water has increased the productivity of the ranch. Plants and trees bear extra crops, an unusual occurrence for an area with a cool climate. According to a CBS report, ‘Up to the Minute’ (KENS-TV, Aug. 5, 1993), the water was found to be 44 grams lighter than conventional water, measured in kilograms per liter. Scientific tests are continuing, but as yet scientists are unsure what is causing the benefits of ‘Mexico’s Lourdes’. The Illumined Cave: In 1992, Mrs. Theo Tommes of Nordenau, Germany was investigating an abandoned slate mine, seeking a place to store wine for the family hotel business. When she entered the cave she was amazed to see it was illumined by a brilliant white light. Also she saw small crosses of light within the glow. Experts were invited to study the phenomenon, and they not only recorded a high level of energy in the cave, but noticed in addition a spring with remarkably pure water. Nadana Village, India: Also in 1992 came a report from Nadana, a small village in India, about 90 miles north of New Delhi. There water began to spontaneously gush from a deserted well. Local villagers who bathed in the water said they were cured of various skin diseases. In a short time the news spread throughout the area, bringing a constant stream of visitors, sometimes 20,000 a day. Most people using the water claimed physical benefits; a five-year-old polio victim was reportedly cured. Mr. Mamraj, who owns the well, says he was offered a large sum of money for it. This he rejected, saying he wanted to use the well for the people, not for making money. Fountain of Youth in China: The German newspaper, Die Süddeutsche Zeitung, reported in 1994 on a Chinese couple, Zhou Lianghua and his wife Li Guirong who think they have discovered a fountain of youth. Both are over 80, but claim to feel 10 years younger since drinking the water from their courtyard fountain. Li says that her formerly gray hair has regained its black color, and Zhou, who was almost bald, now has a thick head of hair. They report they can also hike in the mountains without losing their breath. Is There a Connecting Thread? : Mr. Benjamin Creme, London esotericist, author and artist claims that all of these events are related. He says that for the past 20 years, a number of highly evolved spiritual teachers, whom he calls the Masters of Wisdom, (known to others simply as ‘Angels’) are beginning to take an active part in our daily lives. Their leader, named Maitreya, has been appearing to individuals and groups throughout the world. One such appearance, on June 11, 1988, at a church meeting in Nairobi, Kenya, was documented by CNN. Creme says that Maitreya has appeared to many such groups all over the world  usually he will materialize out of nowhere, address the group for 15 or 20 minutes, then just as suddenly vanish. Of relevance to the present topic is Creme’s statement that Maitreya is ‘energizing’ water sources close to the places where he is appearing. This energizing, he explains, means that part of the physical atomic matter of the water is actually transformed into sub-atomic matter (or light). When weighed in a large quantity (a liter or more) these charged waters are lighter than ordinary ones by 4-8 percent. Creme claims that in time Maitreya will create a world wide network of healing water sources, numbering 777. They will become more potent over the coming centuries, leading to a greater vitality and longer life span for the human race. In the USA, Maitreya is reported to have appeared in San Antonio, New Orleans, Phoenix, Kansas City, Denver, Washington DC, Flagstaff, Richmond, Vir., and Elko, Nev. The Technology of Light: Scientists today are just beginning to probe the nature of the mysterious phenomenon that we call light. Some postulate that matter itself is a construction of light waves in motion, that the material worlds are born from an invisible matrix in space and will ultimately again vanish into its web. Such theories parallel teachings that have been accepted for millennia by the esoteric traditions of many of the world’s religions. A close study of the Buddhist tradition, Hinduism, the shamanic practices of indigenous groups or early Christian Gnosticism all reveal a belief that matter itself is an illusion and will eventually be transmuted to light, its underlying spiritual nature. The energizing of the 777 water sources is just part of a larger undertaking that Maitreya plans, a scientific advance which he calls “The Technology of Light.” This technology is a direct and practical application of the above described scientific and religious ideas positing a coalescence between the world of spirit and the world of matter. Already, he says, in Russia and the US, the “Space Brothers”  highly advanced beings from other planets  are inspiring scientists to discover a means of worldwide surveillance which can make our present armament system totally unnecessary and obsolete. This same technology can revolutionize our present transportation and communication systems. It can cure our environmental ills and transform medical science. In the coming times this profound spiritual knowledge could give humanity a way to lift itself into a more spiritual realm of existence. Maitreya and the group of Masters with whom he works stand ready to help the world find solutions to its most pressing problems of starvation, disease, and environmental degradation. All that is needed is a willingness to build a global vision, to make changes that consider the good of every kingdom in nature and every society on earth  to think, not only of the present generation but, like the Native Americans, of seven generations into the future. In this way, Maitreya says, we can reverse our present destructive course and construct a future society of equitable, peaceful and creative endeavor. After the miraculous healing well in Mexico, another healing water source has been found, in Germany, 100 km east of Dusseldorf. A spring of very pure water, it was discovered in a cave in a disused slate mine at Nordenau, district of Schmalenberg, which is a popular ski resort. The land belongs to Theo Tommes, whose Hotel Tommes lies below the quarry. In January 1992, Mrs. Tommes went into the quarry to look for a spot to use as a wine cellar. Entering a dark, damp grotto, she became aware of a bright white light that filled the whole cave. When it was first discovered, according to Mrs. Tommes’ mother, small crosses of light could be seen within the glowing white light. The grotto was soon investigated by experts who found that it was highly charged with energy. Then they noticed a spring with wonderfully clear water. Analysts at the German Fresenius laboratories tested the water, finding it very pure and clean. They also found that it was 8 per cent lighter than ordinary water. Another German laboratory, Hygene Institut des Ruhrgebiets Gelsenkirchen, have also certified the water to be 8 per cent lighter than ordinary water. (The water at Tlacote, Mexico, was found to be 4.4 per cent lighter than ordinary water.) Stranger still, water at the spring spirals to the left, but five meters further on it spirals to the right. Now hundreds of people daily visit the grotto, which is becoming Germany’s Lourdes. Buses bring the old, sick and crippled, and the Hotel Tommes is packed. Guido Brandenburg interviewed some of the pilgrims for the German newspaper Bild. An old woman told him that after covering her blind eye with the water, she can now see; an ex-miner said his back was healed and he has thrown away his crutch. Another woman said: I always had problems with high blood pressure and was afraid of collapsing. I went to the grotto with my pressure at 160 to 100. I came out with 130 to 100. Now the blood pressure is constant, a fact which my doctor cannot explain. Theo Tommes warns his guests not to stay too long in the grotto. He says they become so strongly charged with energies that they have to leave. Johannes Koch, a geo-physician, believes the water heals because this is a meeting place for at least three watercourses which are places of force. Mysteriously, one section of the grotto remains dry, which Koch believes is caused by earth radiation. He told Bild. : It’s very strong at this point. It’s giving power, filling people up with energy. People are told to drink the water at this dry point where the strong field of energy is. Guido Brandenburg, the Bild reporter, described what happened when he drank the water while standing in the energy zone: After five minutes my fingertips vibrated, he said. I felt as if an electric current flowed through me. A nurse reports on her visit to the miraculous healing water well of Tlacote, Mexico, where she experienced an unexpected miracle. Since May 1991, in the small town of Tlacote, two and a half hours drive north of Mexico City, a well has been producing miracle water. The ranch owner, Mr. Chahin, discovered the healing properties when his injured dog recovered rapidly, having drunk the water. After successful tests on his ranch workers, he opened up his gates to the public. Gill Fry, a Share International co-worker in London, went to Tlacote in July 1992 and has written the following report. As a professional nurse, I was fascinated by reports of Tlacote water having healed so many ailments, including diabetes, epilepsy, arthritis, cancer and even AIDS. Having worked with patients for 10 years who have suffered the pain and anguish of such diseases, the idea of finding a cure, or partial cure, was indescribably exciting. It was thus that I set out, in July this year, on a quest to Mexico to collect the miracle water from Tlacote. From what I had read, I was expecting some hardship, at the very least to wait in line for three or four days and nights, in near tropical temperatures, and took with me a comprehensive survival kit (mosquito net, sunscreens, bedding, etc) and arrived prepared for any eventuality! I had also read that each person’s water ration was generally three litres, and brought along several plastic containers. In the event, my expectations could not have been more wrong. A wonderfully kind colleague of Benjamin Creme in Mexico City took charge of me, drove me to Tlacote and, speaking the local language (which I do not), overcame each barrier and problem. Every door seemed wide open. My three-day stint turned into a mere three-hour wait; my water ration increased from three to 38 litres; and more wonderful still, I witnessed the most extraordinary photograph possibly in existence, which confirmed everything I had believed in for the last six years. Since May 1991 three million people have been to Tlacote, and at least six million people have drunk the water. The ranch owner, Mr. Chahin, keeps the registration files of every visitor, some of whom have travelled from as far as Europe and Russia. Many Mexican government officials, politicians, and artists have been seen waiting in the queue, which varies in size from 5,000 to 10,000 daily. The ranch is very clean and the buildings brightly painted. Huge, lush trees provide the crowd with welcome shade from the scorching sun. I had imagined a dry, desert scene with chaotic, endless lines of exhausted people, but found everything very well organized, with the queue moving quickly and efficiently. After registering, Mrs. Chahin, the rancher’s wife and resident doctor, checks each visitor’s medical certificate and decides on an appropriate quota and dosage, prescribing the water orally, or externally as eyedrops, or enemas or direct application to the skin for skin cancer, eczema, etc. It must be an exhausting job answering a deluge of questions from thousands of people everyday, yet she performs her task with endless patience and kindness, offering her advice freely. None of the ranch hands receives any money for this service, and they work from 9.30 to 15.30 hours every day. Mr. Chahin has never charged for the water, but considering the time and effort involved, to my mind a voluntary donation scheme could provide extra support and may sometime be introduced. After the doctor’s consultation, one stands in line to receive the water. Huge stainless steel tanks, which the government assisted in providing, pump the water to the plastic taps from the deep artesian well that, we are told, will never run dry. Having thought about this moment for months, I felt great elation as I watched my containers being filled. All my hopes were coming to pass and I had been given more water than I had ever dreamt possible. Thanking the ranch workers and tightening the lids further, I briefly pondered on the practicalities of carrying 38 litres of water, and the daunting thought of customs! (Curiously, in the event, nobody at customs asked a single question about the weight or contents of my overloaded bags, overflowing with miracle water.) Such worries were quickly dispelled as I was handed a cup of the water. It tasted wonderful, slightly sweet, pure and light. By the end of the day I had been given three cupfuls and some days later realized my mistake! I was to suffer a gastric upset for a week. The water is totally clean and pure, but very potent. The dosage needed is very small indeed. A couple of teaspoonfuls would have been plenty for me. I was shown around Mr. Chahin’s office which had two long walls stacked with visitors files, and shelves covered with water-testing apparatus. Just as I was leaving, I was shown a framed photograph with the most extraordinary history and phenomenal implications. A man who had drunk the water, and had been healed, took numerous photographs of the ranch. On returning home, he had one frame left on his film. Anxious to finish and develop the film, he took a photograph of his new television set. The television was not on; the screen was blank. To his astonishment, after the film was developed, the last shot showed the television screen with a face upon it: the face of Christ with a crown of thorns on His head. I felt myself shiver as I looked at the powerful image. With limited time, I quickly took several photographs, hoping I could capture the rather faint impression, with the complications of bright sunlight and a reflecting glass covering. Fortunately, the photographs I took seem even stronger than the original, and the face is clearly visible. Travelling home with my exciting news, dragging my bags full of water, I felt triply blessed – my wait in line had been so short; I had been given gallons of water; and I had witnessed the most tangible evidence of Maitreya’s presence. People go to the healing waters at Tlacote and tell of their hopes for healing. Once a month a bus leaves from San Antonio, Texas, taking pilgrims to the healing waters of Tlacote, Mexico. The bus departs on Friday afternoon and returns early Monday morning. There is an overnight stay in the Mexican city of San Luis Potosi. The cost is only $145.00. The idea for the trips began when Tino Duran, editor and owner of La Prensa, San Antonio’s Spanish-language newspaper, heard about Tlacote and decided to drive there. Duran sought help for his own medical problems and also wanted to report on the site for his newspaper. He was amazed at what he saw. After his account was published in La Prensa, people began to call, seeking more information. Because the trip is difficult by car, the highways are dangerous and accommodations sparse, he wanted to provide a bus trip that would make the experience more accessible to the people of San Antonio. As I prepared for the journey, the words of Mother Teresa kept singing in my ears: Let us do something beautiful for God. Along the way, I would meet many people attempting to heed Mother Teresa’s words. On the day of departure, a cold front has lifted the humidity of a hot Texas summer. The natural anticipation of my fellow passengers combines with the energizing air from the north to engender many smiles and cheerful expectations. Adding to the excitement is a three-person news team from the Channel 4 television station in Dallas. They will document the trip for a three-part series to be aired during the most heavily watched week of their season. A free-lance journalist and a photographer, also from Dallas, cover the journey as well. Everyone has a story to tell and each bus stop finds reporters interviewing people, noting their illnesses and expectations. Interviewers question other interviewers. Wally, the cameraman, keeps a visual narrative of the Mexican countryside, the passengers, and the highlights of the trip. Santos, the bus driver, is the comedian of the group. Between hair-raising adventures on the highway, he entertains us with jokes. Rolando Montes, a writer for La Prensa, and his wife, Isabel, accompany each trip, acting as interpreters, problem solvers, and goodwill ambassadors. It is a challenging job, as there are many special requests and some hardships each time. Nevertheless, they both attest to the rewards involved, and it is obvious that their time is given with an open heart and deep compassion. The heart of the Tlacote experience lies in the stories of the people, their hardships and the hope they carry. Joe Morales is traveling with his mother. A car accident has left Joe’s brother brain-damaged, unable to swallow, and requiring constant nursing care. Joe is sharing the medical expenses with another sibling. A few drops of Tlacote water enabled his brother to swallow for the first time. Joe is hopeful that long term use will have a dramatic effect. A brilliant smile always lights the face of Maria Guerra. This is the second journey for her and her husband, Geraldo. Three months before, their first use of Tlacote water lowered his blood sugar level from 275 to 67 within 10 days. A nephew on insulin has been able to decrease his dosage to one-quarter the original amount. Maria’s cholesterol level has dropped from 325 to 236. She feels there are many reasons to be joyful. Lewis Thompson Mohr, a Dallas resident, is making the trip for his wife, Cathy, who has multiple sclerosis and can no longer walk. He cares for her during the day. At night he works, leaving her alone, but surrounded by a support system of telephones and nourishment to fulfill any need which might arise. He has tried many treatments and spent large sums of money searching for help. A Dallas chiropractor gave Cathy her first sample of Tlacote water. When Tom saw the light in her eyes and the energy it instantly imparted, he decided to make the journey. One reason for his faith is that the waters are free and the bus trip of minimal cost. A number of difficulties easily fell away as he made preparations to come. Antonia Gonzales has suffered from arthritis for 30 years. It has deformed her feet and hands. At times her neck and spine are so stiff she is unable to move her head. Her doctor prescribed a spinal operation but Antonia thought the odds for recovery too slender and the cost too high. She decided to take her family on a vacation to Florida instead. On the plane she prayed that she would be relieved of her pain just enough to be able to finish the trip. By the time the plane landed in Florida she was able to freely move her head and neck. Thus began a long journey of faith for Antonia. She says, Every day I wake up and I know that God has given me this pain. I know, too, that it is too great for me to bear, so I pray and I offer it back to Him. He gives it to me and I give it right back to Him. That is how I am able to bear it. Her companion, Angie Murillo, is as radiant as her name implies. After 11 operations she is seeking a different kind of cure. During a prayer meeting at their church, Angie and Antonia discovered they were booked for the same bus trip. Angie offered to take care of Antonia’s many physical needs. Their constant joy and patience fills the bus. Maria Garza suffers from osteoporosis and arthritis. She first went to Tlacote as a sceptic, but eager to seek help for her epileptic granddaughter. After seeing a 70 per cent improvement, she started her own regime. Maria’s son is a chemical engineer. He was also sceptical until he analysed a sample. Noting the water’s unusual properties, he now urges Maria to continue its use. Leo and Aida Gomez are seeking an alternative to medical treatment. Dialysis has been recommended for Mr. Gomez, but they want to avoid the risk and expense it would impose. Mrs. Gomez became disenchanted with the medical system after receiving 27 radiation treatments that she now believes were unnecessary. After a long life of hard work, they are hoping to find enough health to travel and enjoy their retirement. My seatmate and translator, Bertha Cortez, has a visual impairment her doctor cannot diagnose. Her daughter has medical problems, and her grandson an attention disorder, so she is bringing water for the entire family. Throughout the trip we joke about the many vagaries of Mexican travel and Mexican time. These are a few of the millions who come, their hopes expressed in myriad ways. … This has been a journey of hope. For some, it will be the beginning of a new relation to life, a relation built on faith and the power of renewal in that spark of God which we call the human spirit. We have all been touched by our companions on the road. Many of us feel we have shared in an experience greater than ourselves. In some way we sense that in making such a journey, we have, perhaps, done something beautiful for God. Water bound on surfaces of proteins and membranes conducts positive electricity, and could enable cells and tissues to intercommunicate rapidly and efficiently. A version of this article containing the sources and diagram are posted on ISIS members website. Jump conduction down a daisy chain? For decades, scientists have wondered whether water bound to the vast amounts of surfaces of proteins and membranes inside the cells could conduct electric charge in a very special way. If the water molecules were aligned with their positive and negative charges alternating in a chain, as would be the case if adjacent water molecules were linked together by hydrogen-bonds (a kind of chemical bond involving a hydrogen being shared between two oxygen atoms), then a jump conduction of positive electricity could, in theory, take place. This involves the positive charge of the hydrogen nucleus – a proton  passing rapidly down the chain by relay, without the proton actually moving down. The free proton takes over bonding with the oxygen of the first water molecule in the chain, creating a second free proton that displaces its neighbour down the chain until the last proton comes off at the other end  (Fig. 1). Jump conduction is faster than ordinary electricity passing through a metal wire, which involves electrons actually moving, and much, much faster than conduction by charged ions diffusing through water. But it needs to have chains of water in a sufficiently ordered state and protein and membrane surfaces may impose that kind of order on water. Within the past 10 years, evidence for jump conduction of protons via daisy chains of water molecules has come from several sources. According to the story in biochemistry textbooks (and you need a good one to even tell you that), living organisms are charged up predominantly by accumulating protons on one side of a membrane, and discharged by protons flowing back down to the other side. Protons are transported across biological membranes by special membrane proteins called proton pumps. The protons pumped uphill (to a higher energy state), using an external energy source, such as the oxidation of foodstuff, or absorption of sunlight, is returned downhill via another enzyme, ATP synthase embedded in the same membrane, which uses the energy to make ATP, the universal energy intermediate that powers all living activities. This chemi-osmotic hypothesis won a Nobel Prize for British biochemist Peter Mitchell who first proposed it. The protons are supposed to exist in bulk solution on either side of the membrane, and it is the difference in concentration between the two compartments separated by the membrane that drives the synthesis of ATP. Structural studies carried out on these proton pumps within the past ten years show that they form a channel through the cell membrane that is threaded by a chain of hydrogen-bonding water molecules from one side of the membrane to the other . Examples of these proteins are the bacteriorhodopsin, the light-harvesting pigment of the purple membrane belonging to a bacterium, and the cytochrome c oxidase that catalyses the last stage in the oxidation of foodstuffs in the membrane of the mitochondria (the powerhouses of the cell), in which oxygen is reduced to water by combining with protons and electrons. However, biochemists have noticed that the rate of some proton pumps, such as the cytochrome c oxidase – which pumps more than 103 protons per second – is higher than the rate at which protons can be supplied to the proton conducting channel via the bulk diffusion rate . And since the chemiosmotic hypothesis was first proposed, it has been suggested by chemist R.J.P. Williams in Oxford University , and others subsequently , that the protons, rather than accumulating in solution in the bulk of the cell compartment, actually diffuse along the membrane surface; perhaps directly from proton pumps such as cytochrome c oxidase enzyme to the ATP synthase embedded in the same membrane. Experimental observations have suggested that proton conduction could indeed take place along the surface of both natural and artificial membranes at the interface with water, and more specifically in the water layer(s) immediately next to the membrane surface . The long-distance migration of protons along membranes has been observed in purple membranes and reconstituted bacteriorhodopsin, which demonstrated a high rate of diffusion of protons along the membrane surface and a tendency for protons to remain on the membrane surface as opposed to going into the bulk of the cell compartment. When protons diffuse along the surface of membranes instead of through the bulk solution, the rates of proton transport processes are significantly increased . This is due to a fundamental difference of diffusion in two as opposed to three dimensions. In three dimensions, a proton far away from its target – say, the entrance to a proton pump embedded in the membrane – will have a very small probability to be caught by the target. But in two dimensions, the probability of the proton being caught is exactly 1; in other words, it will be caught sooner or later. And if instead of random diffusion, protons are jump-conducted along chains of interfacial water molecules aligned along the membrane surfaces, then proton transport processes can indeed be quite fast. Researchers in the Max-Planck Institute of Biochemistry, Martinsried, Germany first showed that very thin films of water (down to about one layer) adsorbed onto a solid surface exhibits a surprisingly high conductivity while using a scanning tunnelling microscope . The scanning tunnelling microscope depends on the flow of an electrical current and thus cannot be used to directly image insulating material. But in humid air, a thin film of water settles on the surface, and is sufficient to provide sufficient electrical conductivity to allow imaging at currents below 1 picoampere. A model of proton-conducting water chain or proton-wire has come from a further unexpected source: studies on carbon nanotubes. A carbon nanotube is a new form of carbon discovered in 1991 in which carbon atoms are joined up into the shape of a long thin tube. Such tubes are typically of nanometre diameter, and could be microns in length. These nanotubes are found to interact substantially with water. Scientists from the National Institutes of Health, Maryland, and the University of Maine in the United States simulated experimental results on the computer . They showed that a single-wall nanotube 1.34 nm long and .81nm in diameter rapidly filled up with water from the surrounding reservoir, and remained occupied by a chain of about 5 water molecules on average during the entire 66ns of simulation (a nanosecond is a billionth of a second, or 10-9s, which is a long time in the life of a molecule). This result was surprising, because carbon does not have a high affinity for water. But it seems that getting into tight places restricts the distribution of energies in the water molecules, so they end up with a lower average energy than if they were in bulk water, and hence it becomes energetically favourable for the water to enter the nanotubes. An analogy I can offer is how, in a crowded underground carriage, peoples movements are restricted, and hence the range of energy distribution is narrowed towards the lower end of the scale. .O angles between adjacent water molecules exceeding 30o, compared to 37 percent in bulk water. The average lifetime of a H-bond inside the nanotube is 5.6 ps (picosecond, or10-12s), compared to 1 ps in bulk water. The H-bonds are nearly aligned with the nanotube axis, collectively flipping direction from one side to the other every 2-3 ns on average. Water molecules not only penetrate into the nanotubes, but are also conducted through them. During the 66 ns, 1 119 molecules of water entered the nanotube on one side and left on the other, about 17 molecules per ns. This rate is comparable to that measured through the twice as long channel of the transmembrane water-conducting protein, aquaporin-1. Water-conduction occurs in pulses, peaking at about 30 molecules per ns, again reminiscent of single ion channel activity in the cell; and is a consequence of the tight H-bond inside the tube. There is a weak attractive force between the water molecules and the carbon atoms, (van der Waals force) which is 0.114 kcal per mol. Reducing this by 0.05 kcal per mol (less than 5 percent) turns out to drastically change the number of water molecules inside the nanotube, which fluctuates in sharp transitions between empty states (zero water molecule) and filled states, suggesting that changes in the conformation (shape) of enzyme protein molecules may control the transport of water from one side to another in the cell membrane. Do such water-filled channels conduct protons? The answer is yes. 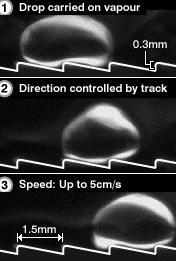 If there is an excess of protons on one side of the channel, positive electricity will spirit down fast, in less than a picosecond, some 40 times faster than similar conduction of protons in bulk water, according to Gerhard Hummer of the National Institutes of Health in the United States, the leader of the team that carried out the nanotube simulation studies . If the nanotubes, instead of swimming in free water solution, were immobilised in membranes, they could be used for all kinds of applications, including light sensing, field effect transistors for proton currents, and desalination of seawater. What role does interfacial water play in the life of an organism? Everything, it seems (See previous New age of water series, SiS 23, SiS 24). Interfacial water accounts for some 70 percent by weight of most organisms including human beings, making organisms effectively liquid crystalline. I have proposed some years ago  that proton-conduction through interfacial water may be how the body intercommunicates at all levels, enabling it to function as a perfectly coordinated whole. This idea is gaining ground  (See The liquid crystalline organism and biological water http://www.i-sis.org.uk/onlinestore/papers1.php#section3 ). – show how neuroscience tends to confirm medieval concepts situating memory, imagination and reason in water-filled cavities of the brain. – build prototype inventions aimed at using water as a source of energy. Some study the big picture, such as the claim that rivers self-organize and energetically recharge themselves through spinning motions. And some point out the well-known anomalies – water is densest at 4 degrees Celsius, and strangely expands when it cools further, so that its solid state floats on top of its liquid state. Water as the “universal solvent” melds with nearly any element. Water’s main ingredient, hydrogen, is spread throughout galaxies, and ice is formed in dust clouds in outer space. The picture of water that emerges is what Acquarian Conspiracy author Marilyn Ferguson calls “the strangest stuff around”. Learning about the mysteries of water evokes a primal foreknowing, like a racial memory, Ferguson wrote a few years ago. “Prescience perhaps – pre-science, something we’ve known for a very long time.” Before our materialistic age lost the abilities to sense subtle energetics, water was central to sacred rituals and symbols. Baptism. The holy river. Spiritual visions of the Ocean of Love. Myths of the flood or of creation. Drinking of sacred waters when visiting an oracle or a shrine. The Sumerian goddess Inanna had a vase in place of a heart, from which flowed miraculous water. The Bronze Age civilization at Knossos on the island of Crete apparently lived by the principle that water should be returned to the earth in the same condition as it was when it was borrowed – treating all water as holy. We’ve had ample warnings. Early in this century Austrian forest warden Viktor Schauberger (1885-1958) warned about wastelands that would – and did – appear on our planet if vast forests disappear. He observed water’s interaction with the forest, such as the vitality of cold, pure water in tree-sheltered streams. “Comprehend nature, then copy nature,” he admonished. He taught that water is a living rhythmic substance. In maturity it gives of itself, to everything needing life. However, water can become diseased through incorrect handling. Dying water harms animals, plants and fish. Whether stilled by a dam or a bottle, stagnant and warm waters begin to deteriorate. Conversely, at a cool 4 degrees Celsius, moving water is densest, strongest and at its best carrying capacity. Wild rivers have inherent self-control mechanisms, if left alone to establish their own homeostasis – that is, if kept cool with natural overhanging vegetation and allowed to meander around bends and therefore be lively with purposeful swirling motion. Shortsighted human engineering – clearcut forests, megaproject dams, and rivers confined into canals – tampers with the circulatory system of our planet. Having interfered with the hydrological cycle, we reap floods, droughts, and other extremes of weather. The book Living Water by Olaf Alexandersson introduces Schauberger’s insights into river management, water-fueled devices and energy. Its successor is the book Living Energies by Callum Coats, that could be the textbook for a new eco-technology – how to construct or encourage processes which don’t fight nature but instead work in harmony. Coats researched for two decades into Schauberger’s discoveries – from forestry to flood control to soil fertility and water purification. Reading this book, hydrologists could learn how crucial are small variations in temperature in a river. Among Schauberger’s observations were how water’s spinning motion recharges it with subtle energies. The naturalist’s warning echoes across the decades, “Prevailing technology uses the wrong forms of motion.” Twentieth-century machines leave behind waste products because their processes use the destructive half of nature’s cycles of creation/destruction – the centrifugal outward-moving motions of heating, burning, pushing, radiating or exploding. They channel air, water and fuels into the type of motion – which nature uses to decompose matter. Schauberger observed that the centripetal inward-spiraling force is the creative, cooling sucking motion without friction, which results in increased order instead of destruction. He applied his understanding of cycloid spiral motion to a wide range of inventions and methods that are in harmony with nature’s creative motion. The “water magician” had solutions for agriculture and energy generation, as well as transport of water in pipes that encourage water’s inward-spiraling motion. Schauberger’s knowledge is sparking experiments by today’s researchers. For example, some Scandinavians called the Malmo group use the phrase “self-organizing flow” to describe what they are creating, since Schauberger’s technology made use of the natural orderliness spontaneously created by a system under the correct conditions (see website for the Scandinavian group called Malmo). Meanwhile, new energy-generating processes such as Dr. Randall Mills’ BlackLight Power convert ordinary water into hydrogen and oxygen. Paul Pantone of Utah runs engines on water mixed with waste substances, and the air that comes out of an exhaust pipe won’t dirty a white handkerchief held on the end of the pipe. About a century ago John Worrell Keely figured out how to run a motor on the power of cavitation, or implosion, while alternately compressing and expanding water. He harnessed phenomena that we dismiss as a nuisance – the “water hammer” in water pipes. Dale Pond, researcher of Keely’s physics, says that Keely’s Hydro-Vacuo motor created a water hammer shock wave which, when synchronized with the wave’s echo, “results in Amplitude Additive Synthesis – tremendously increased energy accumulations” in quick order. Pond warns that this resonance amplification is similar to the process which breaks wine glasses. one fact that emerged is that water is not a single homogenous product of nature. Water in living cells has unique structure, and clusters of its molecules have organized relationships. Another factor is what Schauberger called the “immature taker” vs. “life-giving mature” water. Since water without minerals is a relentless solvent, if we could distill 100% of impurities out of a batch of water it would be dangerous to drink, leaching minerals from our bones. Then there’s the movement=vitality factor. Stagnant bottled water, even though chemically clear, is dead compared to water in rushing brooks. But it has to be proper movement. As water is pushed through cities in the unnatural confines of metal pipes, its energetic oscillations interfere and the natural order in water’s structure is cancelled. How do we know this? For one, German engineer Theodore Schwenk and his Institute for Flow Science developed a technique for photographing the internal structure of water. In drops of water taken near pristine springs, a symmetric rosetta pattern was revealed. On the other hand, the internal structure of damaged municipal water is chaotic. Chemical contaminants and electromagnetic pollution compound the damage and cause chaotic clustering of water molecules. These meetings wrestled with questions such as whether “living water” is an organized state of matter and energy, capable of storing and transmitting information. If so, the implications go beyond homeopathy and “energy medicine” and into the interaction between water and consciousness. Dr. David Schweitzer, grandson of Albert Schweitzer, is the first scientist to photograph the effects of thoughts, captured in water! This shows that water can act as a liquid memory system capable of storing information. David Schweitzer first stepped onto this trail by becoming an authority on blood analysis. He learned that blood cells express themselves in sacred geometry and other harmonious shapes and colors. Since blood cells hang out in water, he looked farther into that substance for answers about our thinking processes. After ten years of observing blood, in 1996 he made the discovery which opened the door to photographing the stored frequencies in homeopathics and natural remedies, and to researching the impact of positive or negative thoughts on bodily fluids. “Having studied the relationship between the brain, cells, and emotions,” he told Joseph Duggan in Vancouver, “I came to realize that certain trace elements were needed to send information from one area of the brain to another.” Minerals alone could not convey information. To find out if the carrier is water itself, Dr. Schweitzer experimented. French scientist Jacques Benveniste had already shed light on the memory of water in homeopathy. He and a dozen other scientists demonstrated that water can retain a memory of molecules it once contained. In 1988 Nature magazine published their experiments showing that if water containing antibodies was diluted repeatedly until it no longer contained a single molecule of antibody, immune cells still respond to the water. The publication drew outrage from orthodox professors, and the magazine later sent a team to Benveniste’s laboratory including the magician James Randi and Walter Stewart, a self-appointed investigator of scientific fraud. The team judged the French scientists’ results to be a “delusion”. However a recent book by Michel Schiff says the slander of Benveniste was the delusion. Dr. Schweitzer says aspects of the homeopathic research couldn’t be measured by the investigators’ instruments. The witch hunt in France didn’t stop him from radical thinking. He remembered Albert Einstein’s idea that particulate “light bodies” also known as somatids act in ways that we don’t yet understand. Waking up one morning with insights on how to make these light-bodies visible, Schweitzer began working on a fluorescent microscope at a certain intensity of light. He wanted to see somatids change in response to thought and other influences. Just before the water on the microscope slides evaporated, he saw certain formations develop “dependent on the thoughts or energy atmosphere it had been impregnated with. I observed that this cluster could be modified at will.” Further work showed that microscopic light bodies in the water intensify in the presence of positive thoughts. They shine brightly if thoughts are backed up by emotion, and it makes a big difference whether the emotions are negative or positive. One of his inventions condenses water from air. “That’s one of the biggest things I’ve been working on – using frequencies to draw moisture out of air.” He and researchers from Los Alamos National Laboratory are working on “a program where you can take a photocell device, put it out in the desert, and it’ll make a gallon of water overnight.” The unit is powered by photovoltaics (electricity from sunlight). Ziesenus agrees with Dr. Schweitzer’s claim that our AC electricity leaves a harmful imprint on water. Another scientist at that meeting, Dr. Glen Rein, points out that physicists know about the existence of energy fields with properties which are not explained by classical equations. He refers to the non-classical fields as quantum fields. Rein’s work again shows that this non-electromagnetic energy – information from the primordial vacuum of space – can be stored in water and can later communicate with living cells. – On the Track of Water’s Secret, by Hans Kronberger and Siegbert Lattacher, Uranus, Vienna 1995. – “Infrared Spectra Alteration in Water Proximate to the Palms of Therapeutic Practitioners”, by Stephan A. Schwartz, Randall J. DeMattei, Edward G. Brame Jr., Ph.D., and S. James P. Spottiswoode, M. Sc. We often perceive liquid water (H2O) to be ordinary as it is transparent, odorless, tasteless and ubiquitous. It is the simplest compound of the two most common reactive elements in the Universe, consisting of just two hydrogen atoms attached to an oxygen atom. Indeed, very few molecules are smaller or lighter. However, liquid water is the most remarkable substance. Although we drink it, wash, fish and swim in it, and cook with it (although probably not all at the same time), we nearly always overlook the special relationship it has with our lives. Droughts cause famines and floods cause death and disease. We are about two-thirds water and, without it, we die within a few days. It has importance as a solvent, a solute, a reactant and a biomolecule, structuring proteins, nucleic acids and cells. Water is the second most common molecule in the Universe (behind hydrogen, H2) and fundamental to star formation. Life cannot evolve or continue without liquid water, which is why there is so much fuss about finding water on Mars and other planets and moons. It is unsurprising that it plays a central role in many of the World’s religions. Water is the most studied material on Earth but it is remarkable to find that its behavior and function are so poorly understood (or even ignored), not only by people in general, but also by scientists working with it everyday. The size of the water molecule belies the complexity of its actions and its singular capabilities. Water’s unique properties and chameleonic nature seem to fit ideally into the requirements for life as can no other molecule. A number of explanations of the complex behavior of liquid water have been published, many quite recently, with several stirring up great controversy. In this site, I have attempted to present these ideas in a self-consistent and balanced manner, which I hope will encourage both its understanding and further work. TylerDurden writes: A team from Technical University of Denmark has generated very unusual dynamic structures in a cylinder of water. A rotating plate inside the water-filled cylinder induces a whirl that develops into stable symmetric shapes, such as pentagons or hexagons that also rotate. This reminds cymatics and shape generation via resonant frequencies within a given medium. The droplets propel themselves over metal sheets scored with a carefully designed array of grooves. The US scientists did the experiment to demonstrate how the random motion of water molecules in hot steam could be channelled into a directed force. The physics at work here has been witnessed by all of us in the kitchen. Leave an empty pan on the stove for too long, and water, when you drip it over the scorching pan bottom, will hover over the surface on a bed of steam. The effect was described in the 18th Century by a German scientist Johann Gottlob Leidenfrost. What happens is that the heat is so intense, it boils the underside of the water droplet without any physical contact with the pan. “We were interested in whether it would be possible to use this phenomenon to move liquids around,” said Dr Heiner Linke, the intellectual power behind the self-propelled droplets. Now the water droplets appear to push themselves off the long-slope side of the grooves and rocket across the heated surface – instead of just dancing on the spot as they do in the kitchen pan. Although the original intention was to devise an arresting demonstration of how random energy can be rectified into directed motion – the focus of Dr Linke’s main work is with molecular motors – the researchers now think there may be a use for the effect in cooling computer microchips. Everyone knows that water likes to stick to water – we see it all the time in the form of surface tension and in the spherical shape of water droplets. Now, a rather surprising result from Greg Kimmel and colleagues at Pacific Northwest National Lab shoes that sometimes ‘water can be hydrophobic’. The team studied what happens when water molecules are added to create a monolayer on a platinum substrate at temperatures in the range 20 to 155 K.
At temperature above about 60K small islands of two-dimensional ice form, with successive water molecules falling off these islands and sticking to the platinum until a solid monolayer is formed. The researchers found that at temperatures less than 120K additional monolayers of water will stick as expected to this initial layer of crystalline ice forms. However, above 135K the system ceases to behave in this way, and becomes more like a waxy leaf or polished table top, where water forms large drops rather than wetting the surface. It seems that of the four bonds that water could form with other water molecules, one is used up to stick to the platinum and the other three are used to stick to each other. The net result is a hydrophobic layer of ice. Only when up to 50 additional monolayers have been added are all the non-wetting portions of the first entirely covered. Whether this sort of phenomenon ever happens in nature is not yet clear. However, it could be relevant in understanding how ice crystals form in clouds after seeding. 75 – 85 percent of our body is comprised of water http://www.hbci.com/~wenonah/hydro/h2o.htm , with a large handful of soil and about 25 pounds carbon dioxide thrown in for a good blend. This doesn’t sound like much, but Oh! Just look at the final product ! What makes it all “tic” ? This seems a little strange when one first learns that very pure water doesn’t conduct electricity. And yet, all the chemical reactions that occur in solution involve and require electricity. Control the electric force, and you can control the chemical reactions. Water’s unique geometry does give it some very interesting properties. Water’s two hydrogen atoms are not across from each other as one might expect from the “Ideal of Symmetry” or charge distribution. Some atoms have electrons in orbits that very closely resemble those of comets, as well as Earth type orbits. Atoms also have a strong preference as to the sequence in which the different possible orbital regions are populated with electrons. Oxygen was the lucky atom that got to fill its electron orbitals in a manner that produced this interesting geometry. Water’s Hydrogen atoms are grouped to one side. This allows a small electric charge differential to manifest across the “two ends” of the water molecule. This charge causes the water molecules to line up and loosely connect producing the effect we call “Surface Tension”. This mechanism allows a needle to float on top or an insect to walk across it. This electric charge also allows the water molecule to “wiggle” its way between certain atoms in salts. This allows the atoms of the salt to manifest their “Ionic Potential” and it’s the atomic ionic potential in solutions that creates the possibility for biological life on Earth. # Thirsty ? You are 2 Quarts Down !!! Most cars have a little light that comes on when the oil pump is no longer pumping oil.Most of you know that if that light comes on you must stop immediately to add oil or risk catastrophic engine failure. The light comes on “After the Fact” that you don’t have enough oil to cool and lubricate your engine. Research has shown that our sense of thirst is an “After the Fact” response. Our thirst craving isn’t activated until we have lost about 28% of our blood plasma. This means we have lost about two quarts of our normal seven quarts of blood liquid. Time to stop and rehydrate yourself or risk having the “solids in your blood” come out of solution and plug up your circulatory system. To understand the chemistry of water we need to know about pH http://www.hbci.com/~wenonah/hydro/ph.htm . Very pure water doesn’t conduct electricity, but as soon as any substance that ionizes in water is added, you have a conductor owing to the fact that the ionized atoms in the water solution carry the current. Knowledge of this property gives one a valuable tool for controlling chemical reactions. For one thing, ionized atoms experience acceleration when an electric field is set up within the solution. Ionized Atoms move toward the charge of opposite sign. This effect is used in electroplating to provide a smooth even coating of atoms on your target material. The electric force causes the atoms to move out of the solution at concentration levels far below those of a saturated solution. Reversing the charge/current will cause the atoms to go back into solution from your material. Electricity can be used to bring materials into solution or to take them out again. Electroplating can be done without the use of an external power source and wires. “Electro-less Solutions” are available that have their internal electrical forces balanced in such a manner, that when a suitable object is placed in the solution, the metal ions will come out of solution and coat the object. Again, if the object were to be connected to a proper external power source, the “plated atoms” will come off the object again. And again, if the object were to be placed in an ionic solution with the right properties, the “plated atoms” would also come off again. This is an important lesson, because all the laws of physics that rule the mineral kingdom are also at work in some way in our bodies. The inside of our body’s “pipes” can become coated, even totally plugged, when materials come out of solution. This Process is REVERSABLE ! Dr. T. C. McDaniel http://www.hbci.com/~wenonah/new/mcdaniel.htm has reported success with about 39 diseases working with 10,000 patients. His method is to administer an I.V. solution with the correct electrical properties to adjust blood plasma electrolytes to bring into solution the problem material. This method is based on the applied craft of Colloidal Science http://www.hbci.com/~wenonah/hydro/index.html , known and widely used in many branches of chemistry. Dr. McDaniel’s method involves mixing salts that are normally found in human blood, (indeed required by the human body) in a crafted manner, so as to achieve the correct electrical potential in our blood’s plasma. We Add SOAP !! !What does the soap do? – It makes the water wetter. – How can wet water get wetter? We add something to the water that changes the electrical properties of the solution, which then makes it easier for the water molecules to wiggle their way between the unwanted “dirt particles”. Adding a surfactant (a surface-active agent) such as detergent can decrease surface tension, but this will not increase water’s carrying capacity unless it changes the basic colloidal chemistry of the liquid by adding a material with negative ions, thereby increasing the Zeta Potenial energy. Soap works by breaking up the electric field which creates surface tension. This allows water to “surround its victim and carry it away”. This works fine if your dirt isn’t stuck to securely to your surface.But what if it is “well bonded” and sticks to itself really well, like the minerals on the sides of your vase? Here is a case where the classic notation inhibits the understanding of the subject. The reason atoms form chemical bonds has more to do with mechanics than it does with electricity. Hydrogen’s positive notation when classed as a Cation, is not because it has two positrons and only one electron – hydrogen has only one positron in its nucleus – it is because with only one electron in orbit, it wobbles all over the place and atoms have a strong desire not to – Inertia you know. When Hydrogen and Chlorine get together, they share the electron in a figure 8 orbital that allows them to achieve a symbiotic dynamic stability. Hydrochloric acid ( H+Cl- ), is what our bodies produce to electrify our stomach fluids. But pure HCl can’t do the job by itself. In order to achieve good dynamic stability, the hydrogen atom and chlorine atom cuddle up real close. It takes water to intervene in this relationship, to allow the electric force to manifest and do its work. The water molecules cuddle up to the hydrogen and chlorine atoms, like so many children wanting to get in on their parent’s hugs. WOW !So, what about the Flower Vase ! Adding a little HCl (or vinegar) to the pure water in your vase will activate the water’s electrical potential giving the solution the power to unlock the atomic bonds that are holding the minerals to the side of your vase. Result — A Clean Flower Vase !!! # Remember, All this is to convince you to DRINK more Water. ??? How Much Water Should One Drink ???Dr. Judith Reichman, during a network morning show, perhaps said it best. We are all individuals, and so are our needs. At times our bodies use large amounts of water to keep us cool. So, the issue resides in not how much water you drink, but in drinking enough water for your body to wash out all the toxins that have acuminated in our blood. So the bottom line, she says, “is that you drink enough water so that you can Urinate Two Quarts a Day”. Drink Enough Water for your body to keep cool and still have enough to wash out your system. Water has many unusual properties that make it unlike any other liquid, some of which make it an ideal substance for aquatic habitats. It takes a lot of energy to bring about a change in water temperature. On a hot day pebbles on a beach will often get hot enough to burn your feet, and it is some­times possible to fry an egg on the bonnet of a car that has been standing in the sun! Yet the average pond will not increase in temperature by more than a few degrees, even on the hottest day. Even on cold days, water temperature changes slowly. Without this property, water would quickly reach unacceptably high temperatures on a hot summers day and freeze solid on a cold winters day! This resistance gives aquatic environments a high degree of thermal stability, which means that fish, unlike ourselves and other warm-blooded creatures, do not have to waste valuable energy trying to maintain a constant body temperature. Water freezes or melts at higher temperatures than its structure would suggest (certainly, when compared with a substance of similar molecular structure such as hydrogen sulphide, H2S). The atomic structure of water suggests that it should be a gas at room temperatures. Also, unlike other similar molecules, there is a large difference in temperature between the freezing and boiling points (a difference of 100oC). This makes water a secure habitat for fish because it is not constantly evaporating or freezing solid. Now the odd thing about water is that at temperatures below 4oC the colder water – because it is less dense – will ‘float’ to the top of the pond, leaving the denser, warmer water at the bottom. Because of this peculiarity, ice floats on water and, by forming an insulating layer on the surface, helps prevent water below from further cooling and thus freezing. (That is not to say that the water at the bottom of the pond could never freeze. For a very small, shallow pond during a hard winter it is indeed possible.) It is the warmer water at the bottom of a pond which has enabled fish and other aquatic animals to survive during severe winters. However, fish keepers should be aware of that pumps and air-stones will ‘mix’ the water and produce a near uniform temperature over the whole depth of the pond, particularly when bottom drain feeds are used. Under such conditions the bottom temperature may be just above freezing and the ‘comfort zone’ lost. During such spells water turnover should be reduced to a minimum. Water can dissolve many substances, including atmospheric gases like carbon dioxide and oxygen (and fish breathe in oxygen and breathe out carbon dioxide, just as we humans do). Indeed there are few substances which do not dissolve in water to some extent. It is this property which turns water into a complex chemical cocktail and causes its composition to vary from one area of the country to another. Why is water so unusual? The chemical symbol for water is H20. These symbols are a shorthand which tell us that water consists of two atoms of hydrogen and one atom of oxygen. These atoms are joined together to form a molecule of water. (A molecule of water is the smallest possible bit of water, which is invisible to the naked eye, so that water as we see it consists of millions of water molecules). The water molecule is unusual in that one end of it carries a slight positive electrical charge, and the other end a negative charge, like a magnet. These charges attract water molecules to one another and causes them to stick together. It is this “stickiness” that gives water many of its unusual properties and resistance to changes in temperature. It requires a lot of energy (heat) to break these bonds and bring about a change in temperature. In general, charged particles have only a single charge (either positive or particle having the opposite charge (opposites attract). Particles of the same charge will repel each other. But water, because it has a different charge at each end, can attract both negatively and positively charged particles. Now, for any substance to dissolve in a liquid there has to be some attraction between the substance and the liquid particles. The ability of water to attract other charged particles, regardless of their charge, gives water its superb solvent powers as well as its ability to take part in many chemical reactions. The water molecule can also be split to form two charged particles called ions. (An ion is a general term for a particle that is either positively or negatively charged.) As explained above, water con­sists of hydrogen and oxygen atoms combined together, which are uncharged. But when the bond between them is broken the water molecule divides to form hydrogen ions, H+, and hydroxyl ions, OH-. These hydrogen and hydroxyl ions can take part in chemical reactions with other charged particles, thereby forming new chemicals. So we see that water is not the inert substance that we might have imagined it to be. It has many properties which are unusual. Somewhat paradoxically, as well as providing a stable, secure environment, it is also a reactive substance and this enables it to take part in a multitude of chemical and biological reactions which play such a major part in determining the quality of the environment in a fish pond or tank. This was a odd, little, simple experiment that I performed. It was quite interesting as it proves that magnets can affect water. Since our bodies are 71% water, magnets should have some sort of effect of the human body. Magnetic healing may not be so “crazy” as the sceptics would like us to believe, eh? # Materials : 2- identical plastic containers (empty yogurt containers work great) Some Nice clean water A large magnet (2″ in diameter or larger) Thats it! # NOTE: The magnet should be have it poles on opposite faces, not end to end or the effects cancel. If you use a large ring magnet the hole in the center should be small as it produces the opposite field as the face does. Let the containers sit overnight (a few hours should produce effects, but the longer the better) and the next day taste the two. It is important that you haven’t ate anything prior to tasting the samples or you won’t be able to tell the difference. It will probably take several tastes of each to determine the difference. The texture of the water is different, and there is a small difference in taste. I have found that the after treating our water (that is quite gross) the resulting product is much better. The water is “smoother” and doesn’t have as much of a bitter taste to it. Strong rare earth magnets would work really good for this, small ones the size of a penny should work. Most of you (I did) will use ceramic magnets. I used a 2.75″ diameter ring magnet which had a 1/2″ hole in the middle. I set it under or above the container in different trials. I always used the north pole pointing down into the water, south works too and gives different results than north.